KISHTWAR, Aug 21: In yet another tragic accident during the past 24 hours, 13 persons including 11 more Chandi Mata pilgrims were killed when an overloaded van they were traveling in skidded off the road and plunged into river Chenab near Noos Padhyarna area on Kishtwar-Padder highway early this morning. The ill-fated vehicle bearing registration number JK17-3594 was on its way to Kishtwar from Padder when the driver lost control and it plunged into river Chenab resulting into on-the-spot death of 12 persons and severe injuries to a minor girl. As per the eyewitnesses, the vehicle was being driven rashly and it hit several boulders in the gorge before submerging in the river. On getting information, a police team from Kishtwar Police Station rushed to the spot and started rescue operation with the help of Army personnel and locals. Former Minister Sunil Kumar Sharma, Deputy Commissioner Angrez Singh Rana and SSP Rajinder Kumar Gupta also rushed to the spot to personally supervise the operation. During the operation, the police personnel noticed a minor girl struggling for the life and immediately brought her out of the gorge and then shifted her to District Hospital Kishtwar. Keeping in view her critical condition, the doctors referred her to Government Medical College Jammu for specialized treatment. However, she succumbed to injuries near Doda and her body was kept in the District Hospital Doda for post-mortem and other legal formalities. 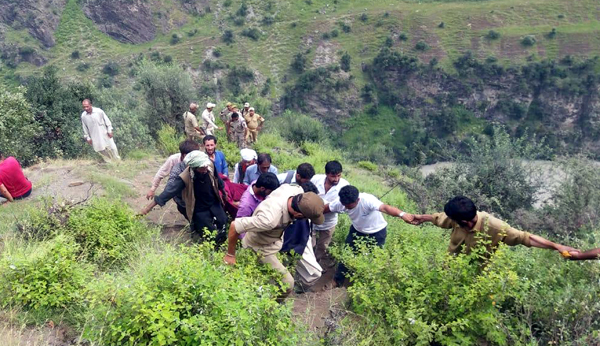 Because of the steep slope, the police personnel faced difficulties in bringing out the scattered dead bodies of 12 passengers from the gorge and shift them to Kishtwar Hospital. After completing legal formalities, the bodies of the deceased were handed over to their legal heirs for last rites. The deceased have been identified as Abdul Ala, son of Sajjad Hussain and Danish, son of Mehboob, both residents of Baderna, District Kishtwar, Badri Nath, son of Nain Singh and his wife Safedu Devi, Kewal Singh, son of Dhani Ram, Dev Raj, son of Dhani Ram, Sushma Devi, wife of Kewal Singh, Brishma Devi, wife of Dhani Ram, Sandesh Devi, wife of Dev Raj, Sonam and Jyoti, daughters of Kewal Singh, all residents of Goha Muthi, District Doda, Bhadar Singh, son of Bhim Singh and his wife Pushpa Devi, residents of Malan Dessa, District Doda. A case under relevant Sections has been registered at Kishtwar Police Station and investigation started. It was due to overloading and rash driving that the tragic accident took place. The vehicle was carrying 13 persons including driver against the seating capacity for 8 persons. The vehicle crossed various check points installed by the State Police but no one dared to seize the vehicle for being overloaded. Had the overloading in the vehicle been checked by the cops at any of the points the tragic accident could have been averted, people said, adding “there should have been a proper mechanism to check overloading in the vehicles especially when Chandi Mata yatra is witnessing massive rush this year”. Meanwhile, Governor N N Vohra has expressed grief over the loss of lives in the tragic accident and has conveyed his sympathy to the bereaved families. Union Minister and Member Parliament (MP) Kathua-Udhampur-Doda constituency Dr Jitendra Singh has also expressed grief over the loss of lives in the accident. “Governor’s regime must come down heavily on the persisting menace of over loading, which unfortunately, the earlier Government failed to deal with effectively”, Dr Singh added. National Conference President Dr Farooq Abdullah and Vice President Omar Abdullah have also expressed grief over deaths in the tragic road mishap.